And clouds of debate lower, threatening strife. I recommend some of Samantha’s cream biscuit. Would you make him good-nature? Invite him to dinner. Fee Essau with pottage, and with meal buy a blessing. 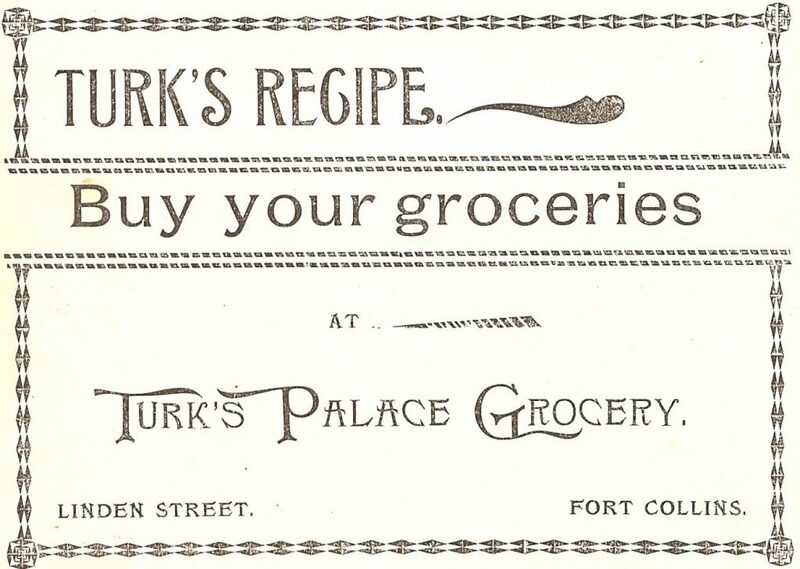 This unique little cookbook has receipts (recipes) submitted by the who’s who of pioneer women in early Fort Collins. Early recipes did not contain amounts, type of pans to use, how long to cook, or how many the recipe would feed. The women just knew! Macaroni Soup – Boil macaroni until tender; boil a soup bone with all kinds of vegetables, pepper and salt, and when done strain and add macaroni. Let boil a few minutes and serve hot. Beef Roll – Three pounds of steak; one half pound pork, chopped together, two eggs, two teacups of rolled crackers, milk enough to soften, salt and pepper to taste. 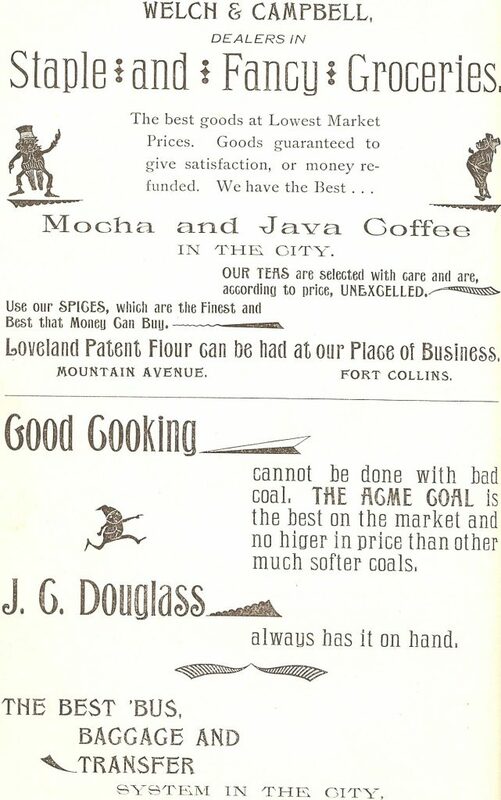 Advertisement from Our Best Receipts, a Fort Collins cookbook from 1896. Do you recognize any of the women who submitted recipes? Beef Omelet – One pound of fine chopped beef; three large crackers rolled fine; three well beaten eggs; piece of butter size of a walnut, salt and pepper to taste; mix well together than make into a long roll and put in a pan a little larger than the roll and bake as a roast. When cold slice as needed. Larded Potatoes – Pare and punch a hole through the potato lengthwise; roll a thin piece of seasoned bacon and put into the potato. Bake until done. Serve hot. Good. Raw Tomatoes – Do not loosen skin with scalding water, it impairs flavor and destroys crispness. Pare with keen knife, slice and lay in glass dish. Season with pepper, salt and vinegar, stirring piece of ice rapidly around in the dressing before pouring over tomatoes, set dish in the refrigerator until wanted. Bean Sandwiches – Baked beans mashed to a paste; add mustard and finely chopped celery leaves. Serve between brown bread. 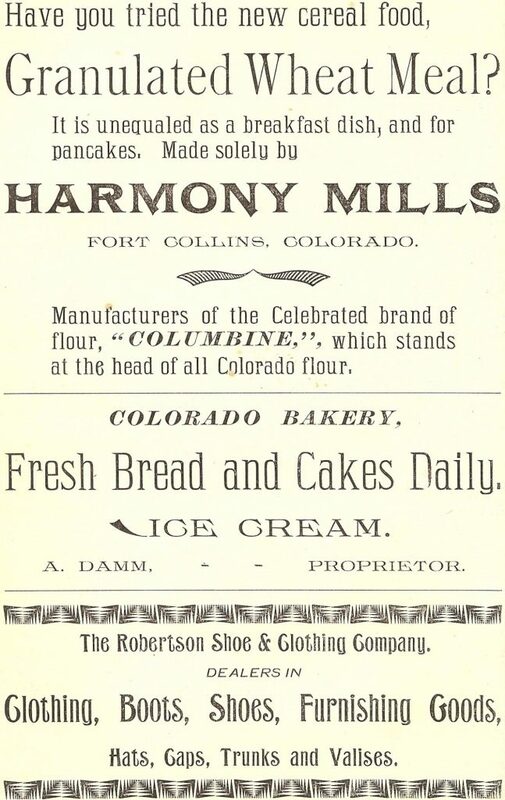 1895: Peanut butter and Salisbury steak. 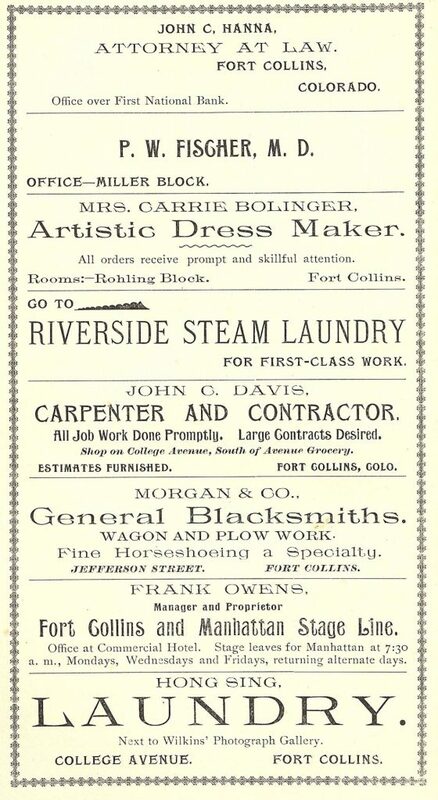 1896: Chop suey, Corsicana fruitcake, oatmeal cookies. 1897: Jell-O, & tangelos, 1000 Island dressing, cotton candy and Melba toast. 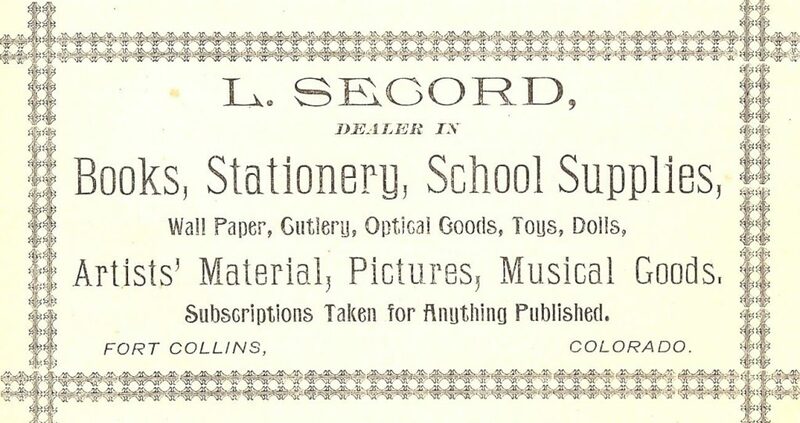 1898: jelly beans, & candy corn, Pepsi and Texas sweet onions. 1901: peanut butter & jelly. 1902: Nabisco’s Animal Crackers, Karo syrup, Mt. Clemens Flakes, & Marmite. 1903: Club sandwiches and canned tuna. 1904: banana splits & Ovaltine, and New Zealand kiwi. 1905: New York pizza and submarine sandwiches. 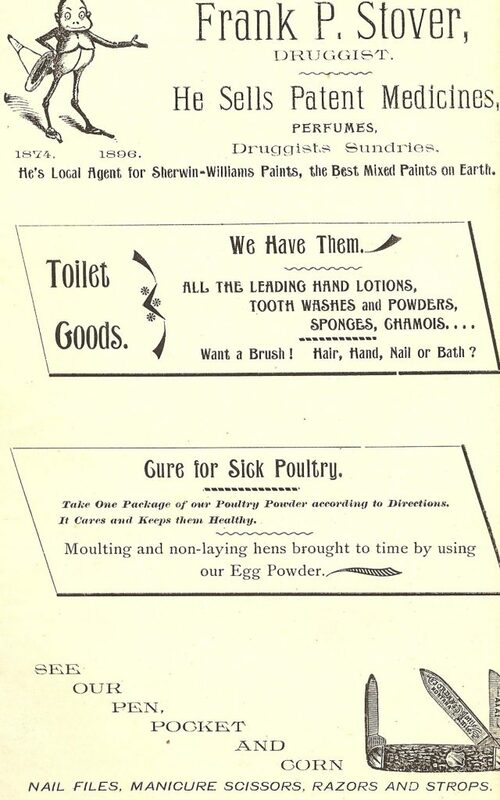 1906: Kellogg’s Corn Flakes and Muffoletta sandwiches. Old hand-written recipes speak a different language. Imbued with the mystical aura of capable hands, they suggest a kind of knowledge that isn’t spelled out in modern recipes. In the silence hangs the wisdom of a coterie of cooks who simply know how. Although the indefiniteness of “flour until it is enough” leaves us insecure and feeling vaguely deficient, for cooks of earlier centuries there was no mystery. The old recipes characteristically called for rough amounts such as “butter the size of an egg,” or “a teacup of sugar,” but in our world of scientific measurement, we want to know just which egg or teacup they meant. A farming wife with a large hen might be cooking with larger eggs than those other neighbors whose chickens were smaller. This was also somewhat seasonal—in the spring young hens or pullets, laid very small eggs. And there must have been variation within the flock, according to genetics and feeding. How much butter, then, in an egg? And how many eggs should one use, if their size was irregular and your recipe called for six? Perhaps it didn’t matter so very much. Perhaps that quantity was more an approximation than a fixed and unyielding amount. In that time, one learned to cook by observation and demonstrations, by example more than a printed page. You learned to judge the critical amounts and processes of each step by watching smelling, tasting, touching and listening. 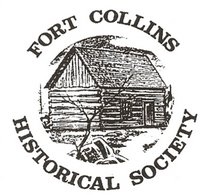 One knew when the proper amount of flour had been added because of the physical signs—“a spoon will stand up in it”—or when it achieved a certain color or flavor—“beat until light-colored.” Sensory experience was more dependable than volume measurements in a time of limited household measuring equipment, and to this day remains one of the critical standards for experienced cooks. In similar fashion, the method for putting a recipe together was often omitted. Everyone already knew. Thus no directions were offered except to suggest that it needed vigorous combining. The single instruction was, “Beat to death” (Anonymous recipe collection, author’s collection). Then, too, daily cookery was far less varied than ours today, and the basic, generic recipes of commonly prepared dishes were well known by all. In such cases, the measurements and directions in a personal recipe collection did not need to be explicit and complete, as they were simply variations on a well-known pattern. Therefore a recipe that carefully noted exact amounts of spices but was casual about flour (perhaps omitting it entirely in a cake recipe, for example) fully expected the cook to know enough to add flour and how to judge the signs for proper batter thickness. In addition, I suspect that many of the early recipes were flexible enough to accommodate small differences in the proportions and still turn out a decent, if a somewhat different result. Wonderfully, after the advent of the late 19th-century determination to apply science to cookery, the old terms were updated. For example, a Long Island fundraising cookbook very helpfully noted, in a long list of measurement tips, that butter the size of an egg was equal to 2 ounces, while butter the size of a walnut was 1 ounce. I have not yet found a modern equivalent to the early “bowl,” and would be most grateful for readers’ help. There were, of course, some recipes that were very specific about amounts, and let you know that in their case you had to be precise. Following the European style, weighed-out ingredients permitted accuracy of measurement. Mary Randolph’s bread (Virginia Housewife, 1824) for example, tells you that you will need 1 quart of flour for a loaf, and that this will weigh 1¼ pounds. And that quantity is indeed right for a marvelous loaf. Temperature measurements fall into the same pattern. Early candying recipes were very descriptive about each sugar syrup stage, without the Centigrade and Fahrenheit systems. They knew, for example, that when boiled sugar syrup reached the temperature at which a drop off the spoon would leave a thin thread “flying,” you had reached the soft ball stage and your cooled mixture would have the texture of a chewy caramel. Today we want to depend on thermometers, which unfortunately have their own drawbacks of inaccurate calibration. If the old method worked, why did cookery adopt science in the kitchen? Fashion entered into it, of course, and the need to improve on homemaking image. Fanny Farmer, of the Boston Cooking School, is generally credited with reformulating American cuisine through scientific measurement and careful directions, although in many cases the quality of her food suffered. She was more a scientist than cook, I’m afraid. She must have known that the printed page could not apply the sensual standards of when the flour is “enough” or just how much butter would equal the volume of an egg. Her science was a viable accommodation to changing times, when increasing numbers of uninstructed women were broadening their culinary repertoires with a fashionable and broadening cuisine. And she opened the door to the world we live in today, to our great desire for variety, and our embracing of the myriad ethnic foods and exotic dishes our grandmothers never heard of. How do you get an old recipe to work, if you haven’t learned by watching and trying at the side of a master? One way is to find a modern recipe that seems to be close, and practice it, observing closely the textures and tastes along the way. Then, try the old one, comparing it with what you have learned to expect (it won’t necessarily be the same), and the results. And then apply some common sense, adjusting thickeners or liquids or seasonings as required. Good luck!